CVS Health and Aetna executives defended their $69 billion proposed merger before the California insurance commissioner on Tuesday, as a panel of antitrust experts and healthcare providers chipped away at the companies' promise to lower U.S. healthcare costs and improve the quality of care without harming competition. Although California Insurance Commissioner Dave Jones doesn't have direct approval authority over the merger because Aetna isn't based in California, his opinion could influence how other state regulators view the deal. During Tuesday's hearing, executives from pharmacy chain CVS Health and insurer Aetna rattled off the benefits of their merger, in which Aetna would become a subsidiary within CVS. The deal, which is being scrutinized by the U.S. Justice Department, would allow the companies to create a new model of healthcare where patients could get the information and resources they need to manage their own care at convenient community retail clinics at a lower price, the executives said. CVS pharmacists would help fill gaps in care between regular doctor appointments to keep patients healthy and prevent illness, while also referring CVS' Minute Clinic patients to primary care doctors in the area, company officials explained. They would provide personalized counseling to tackle chronic diseases and deploy digital tools to manage care and simplify patients' experience. The deal would result in $750 million in cost savings in about two years, largely by getting patients to stick to their medication regimens, said Thomas Moriarty, an executive vice president and general counsel at CVS. Those saving would be passed to consumers through lower premiums and better quality services, he said. Nothing in CVS-Aetna plans would harm competition or raise prices in the insurance, PBM or retail pharmacy markets, the companies' executives told Jones. "Our acquisition of Aetna does not further concentrate the healthcare sector," Moriarty said. "Instead it reconfigures it to bring together disparate parts of the healthcare system that today lead to inefficient, ineffective and more costly care." Antitrust experts and provider organization representatives who testified at the hearing weren't buying it. Dr. Barbara McAneny, president of the American Medical Association and an oncologist in Albuquerque, told Jones that the AMA is recommending that state and federal regulators block the proposed merger after an analysis found it "would substantially lessen competition in many healthcare markets to the detriment of patients." The association's analysis concluded the deal would increase premiums for Medicare Part D drug plans and increase drug spending and out-of-pocket costs. Speaking as a physician, McAneny also argued that the merger would make it harder for oncologists to care for patients by increasing the price of already expensive specialty pharmaceutical drugs used to treat complex diseases like cancer, cystic fibrosis and autoimmune diseases. CVS' size and dominant position in the specialty pharmacy market allows the company to "effectively force" patients to use a CVS specialty pharmacy, she said. The merger would mean Aetna members would likely be compelled to use a CVS specialty pharmacy instead of going to a hospital or doctor's office to have the drugs administered, which could harm patient safety, she said. 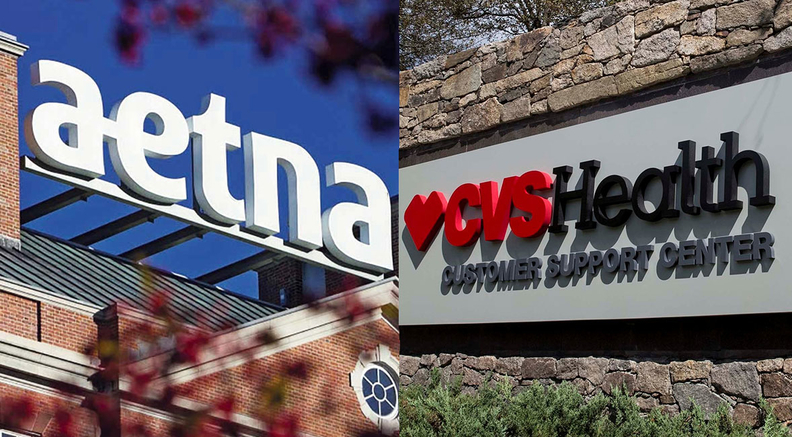 The proposed deal between CVS and Aetna is described as a vertical merger because the companies provide different services along the supply chain. While federal regulators have blocked proposed horizontal mergers between companies providing the same type of service, including Aetna's proposed merger with Humana, they haven't challenged many vertical mergers in the healthcare industry. A wave of hospital-physician mergers that went unchallenged by antitrust enforcers ended up raising healthcare prices for consumers, and that's likely to happen with the CVS-Aetna deal, said Tim Greaney, a professor at University of California Hastings College of the Law and former assistant chief in the Justice Department's antitrust division. "Based on what we know right now, I think the CVS-Aetna merger has the potential and is likely to lessen competition in the standalone prescription drug plan market," Greaney said. The companies' officials, however, argued that there is little overlap in the Medicare Part D market, and divestitures could address any significant concerns. Greaney also said that the CVS-Aetna deal, when viewed alongside another proposed merger between Cigna Corp. and Express Scripts, would give the companies incentive to exclude competitors by cutting them off or raising prices. For instance, CVS' PBM now deals with all insurers, but when it merges with Aetna, CVS would have a greater incentive to raise cost for Aetna's competitors or cut them off from PBM services completely, said Diana Moss, president of the American Antitrust Institute. Payers and employers could search for another PBM, but choice is limited in the consolidated market. CVS' Moriarty argued it would continue to serve other health plans besides Aetna and Aetna customers would still be able to fill prescriptions at non-CVS pharmacies. He added the company has no plans to change or narrow its network post-merger. Kristen Miranda, Aetna's California market president, likewise said the insurer doesn't plan to change up its provider network as a result of the merger. Lawton Burns, a healthcare management professor at the University of Pennsylvania's Wharton School of Business, argued that the CVS-Aetna merger has failed to prove any benefits would outweigh its anti-competitive effects. The two companies are merging not to deliver on their lofty promises, he said, but to defend against new competitors like Amazon, which is moving into the pharmacy business, and old competitors like UnitedHealth Group, which has long been an integrated healthcare company with an insurer and a pharmacy benefit manager under one roof. Burns said there have been no past vertical mergers that benefited patients. Several antitrust experts also warned that the merger between Time Warner and AT&T, which was cleared by a federal judge last week, did not clear the path for all vertical mergers. Many industry analysts had said that blockbuster merger boded well for the CVS-Aetna deal.